Is something in the shade or in the shadow? Two words may sometimes seem to have similar meanings but are actually different under proper contexts and when used in various ways. Shade denotes a general state and often refers to a significantly sized dark area that resulted from a blocked light source, usually the sun or other similarly bright lights. Thus, you may have picnics under the shade of a tree or rest in the shade on a hot afternoon. In this context, the focus is on the absence of light or the dark area itself. How or why the shade was created is not that important. Meanwhile, shadow implies a specific dark area with a definite shape that resulted from the object that is blocking the light source. Your very own shadow resembles a shadow in a distinguishable form of a person, right? When we speak of a shadow, the focus is on the evidence of the absence of light so the object that created the dark area matters. When used as nouns, shade is an uncountable noun that refers to an area of relative darkness blocked off from the light. Shadow, on the other hand, is a countable noun that refers to the silhouette or dark image formed by an object blocking the light. It is what causes the darkness. When used as verbs, shade means to shield from light; while shadow means to block the light. To differentiate the two words, H.W. Fowler pointed out that “shadow is to shade as pool is to water.” Shadowy means “like a shadow”; while shady is “full of shade”. The words “shade” and “shadow” both connote emotions. 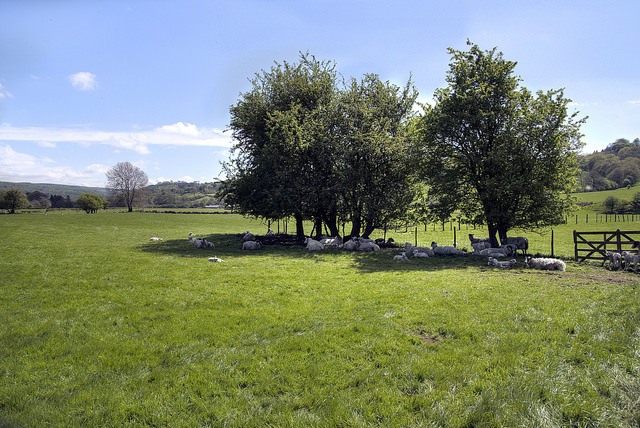 Shade often carries with it pleasant associations when used within the context of climates. For example, those experiencing extremely hot temperatures may find the word “shade” rather soothing. Shadow, on the other hand, is often associated with gloomy or unpleasant situations. A bad news can cast a shadow on an otherwise lively celebration, and send the crowd home. Meanwhile, shade is sometimes used to refer to the spirit of a dead person, or a ghost. 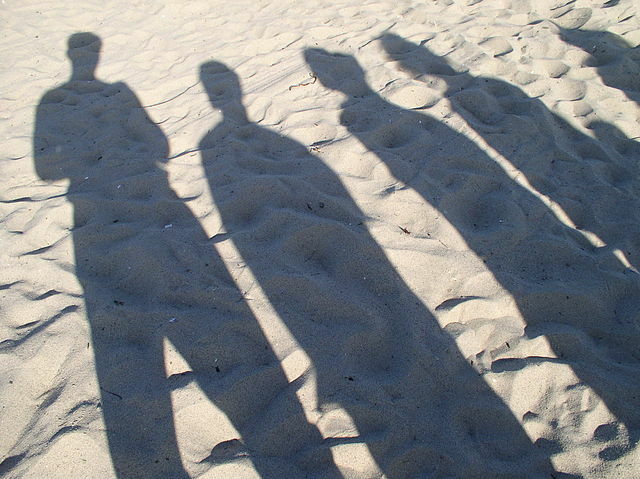 The word “shadow,” especially in its plural form (shadows), is usually evocative of something mysterious or threatening. Shadows of ordinary things can appear strange, and criminals are often hiding in the shadows. Shadow can also be used to refer to the personality, reputation or influence of a person that can make another look inferior. How is it always feeling second best in a sibling’s shadow? The term “Shadow” is also used by Carl Jung to refer to the aspect of the human personality that is created by unpleasant emotions and fears. Shade and shadow both originated from “sceadu,” an Old English word meaning “shade, shadow or darkness”. Although these two words have almost the same general definitions, each has at least 40 different dictionary meanings that can be used in numerous different ways. Wendi Garcia. "Difference Between Shade and Shadow." DifferenceBetween.net. 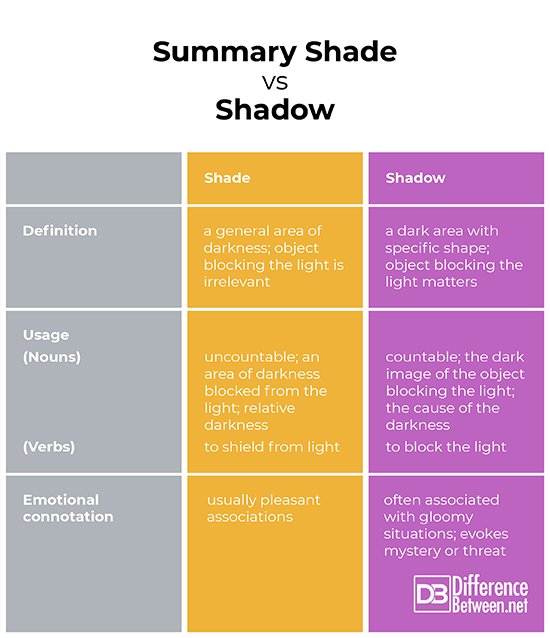 September 25, 2018 < http://www.differencebetween.net/language/difference-between-shade-and-shadow/ >. Serenity Carr. “The Difference Between Shade and Shadow.” Merriam-Webster, February 17th 2017. Web. 4 Sept 2018. Maeve Maddox. “The Difference Between Shade and Shadow.” Daily Writing Tips. Web. 4 Sept 2018. Quora. “What's the difference between a shade and a shadow?” Web. 4 Sept 2018.